Products - Quality Surfacing, Inc.
Quality Surfacing specializes in paving, resurfacing, patchwork, chip seal and seal coats for residential and commercial properties. By putting a new surface of hot mix asphalt over your driveway, you are increasing the overall life expectancy of the entry way to your home. Resurfacing older driveways is necessary if the existing one is corroded, worn out, or cracking in many parts of the property. A newly resurfaced driveway will increase the value and durability of your property; ultimately inviting visitors into your dwelling place. 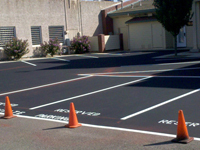 Patchwork creates a bond with older asphalt overlays and newer durable patches; thus, increasing the strength of older driveways, parking lots, speed-bumps, trenches, etc. 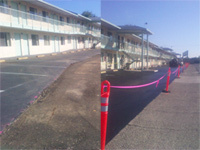 The primary function of patching over old asphalt is to gain a few years of use to the existing property. If there are many cracks and broken areas of the asphalt, it may be beneficial to resurface your entire driveway. Chip seals are not the solution for everyone, but in the right circumstance they are definitely worth the time, effort and money to install. The true intent for a chip seal is to seal the surface of the driveway, road or highway, and to also establish a new wearing surface on top to further enhance the longevity and durability. Chip seals are also used for aesthetics as a way to cover up an asphalt-paved driveway or road and make it look like a gravel road. 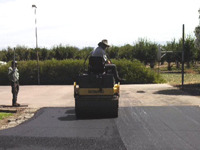 For further information about chip seals go to the Asphalt/Chip Seal Driveway FAQ or give us a call @ (530) 527-9382, and we would be more than happy to assist you. Asphalt driveways are made up of many different environmentally safe products: stone (aggregate), fine stone, asphalt cement and sand. These different ingredients are bonded together by the asphalt cement to form a very strong hot mix, which is usually about 350 degrees in temperature. Seal coating (or sometimes called slurry seal) is put on driveways with squeegees to help the asphalt protect itself from the effects of the sun, tire marks, aging, etc. Over time the asphalt may become cracked or brittle, making the asphalt fall apart. 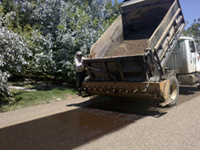 By sealing the asphalt you will prevent as little damage to the existing asphalt as possible. Preventative maintenance here is the key to seal coating!